While swimming is a popular way to stay healthy and showering in cold water is an exhilarating experience, swimming in cold water on the other hand is not a very appealing prospect to most people. Nevertheless, there are always exceptions to the rule. At The Outdoor Swimming Society, there is a community of daredevils who find the prospect of swimming in a warmly heated, chlorinated pool a little bit boring! Started as a group of friends in 2006, the community now has over 16,000 newsletter subscribers and 10,000 Facebook likes, with highly attended cold water swimming events taking place on a regular basis all across the country. While some participate in cold water swimming events to get closer to nature, others simply love the exhilarating feeling and subsequent euphoria that the activity provides. Further still, evidence suggests that cold water swimming is an excellent way to treat high blood pressure. If you’re considering taking up this niche hobby, here are some top tips to ensure that your experience is enjoyable and, most importantly, safe! While cold water swimming is known to provide numerous health benefits, it isn’t appropriate for everyone due to the fact that immersing yourself in cold water will put more strain on the heart. 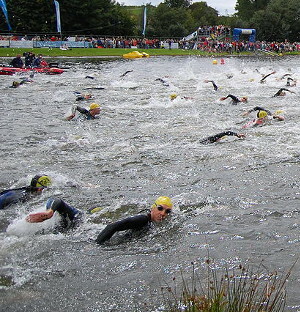 If you suffer from coronary artery disease, cold water swimming may not be an appropriate activity for you. Just as you wouldn’t attempt to benchpress 100kg on your first trip to the gym, it’s not a good idea to dive into cold water until your body has become acclimatised to it. Progressive desensitisation is the best approach. Make it a goal to swim for a couple of minutes in cold water, and then gradually increase this amount every time thereafter – you’ll be competing in outdoor races in no time! The majority of body heat is lost through the head, so it’s important to keep your skull nice and warm when embarking on an outdoor swimming event. Neoprene caps are thought to be the most powerful material for heat insulation. Alternatively, wearing one cap on top of another will also do the job! Wearing a wetsuit will not negatively impact the experience of swimming outdoors, and especially if your body is not yet acclimatised to outdoor swimming, it’s a good idea to wear one. Particularly for newbies, there is a small but realistic amount of danger when swimming in cold water. If you aren’t sure how long your body can endure the cold temperatures, it definitely helps to have a partner with you to ensure that no accidents occur. Immersing yourself in cold water is a shock to the system, and if you allow yourself to be freaked out by the physiological impact of the cold temperatures then you may find yourself breathing heavy or even hyperventilating. To combat this, it helps to learn some breathing exercises so that you can push your anxieties to the side and have an exhilarating swim. If you are feeling unwell however, don’t try to be tough and stick it out – you can always come back to the water another day!